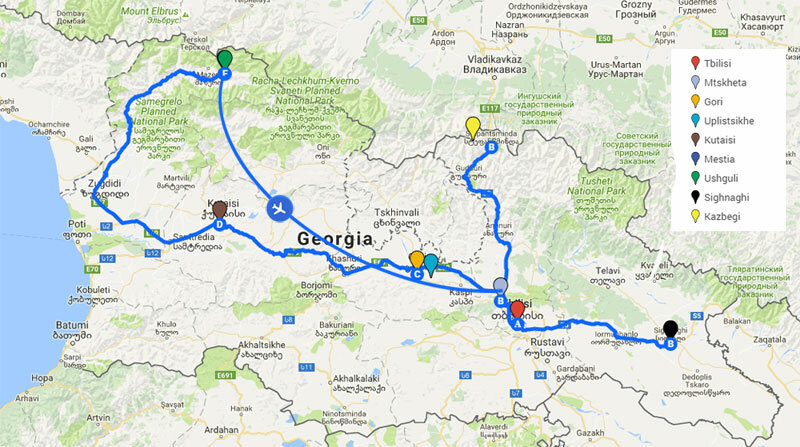 Although we had planned seven days in Georgia, you may want to spend at least 12-15 days visiting the mountains, glaciers and valleys. But seven days will give you a quick overview of this beautiful country. Roads in Georgia are great overall, other than a some potholed roads inside cities and some highways. Although police are plenty and everywhere, there are no set rules when it comes to driving. If you intend to rent a car then be prepared for some “off-road” and crazy driving. Public transportation in big cities are abundant and cheap. Georgian is the main language, but everyone speaks Russian, and a lot of people speak basic English, especially in cities. Food comes cheap and delicious. Georgia is a culinary heaven for meat-eaters, but for vegetarians it can be a bit of a challenge. A lot of countries have an option of visa-upon-arrival, but it’s best to check their website and apply for a visa well in advance as the consulate may take anything between 1 to 4 weeks. Also, the visa upon arrival may be applicable to citizens of certain countries with different rules, based on the pre-existing visas or residency levels in the country you’re living. Visa are given typically for 30 days. Georgia requires visas for citizens of non-U.S. or non-E.U. countries, but it becomes ‘not required’ if you hold a permanent residency of U.S., E.U., or Australia. Georgia’s currency is Lari. The Lari is sub-divided in to Tetri. The abbreviation GEL or the symbol used is ₾. Currency notes of 5, 10, 20, 50 and 100 GEL are common in use and notes of 1 and 2 are rarely found. Most exchange centers around the country offer a good rate, but the banks offer the best exchange rate. The rate with most currencies remain almost constant so make sure to check some exchange rates around the town or city before changing. Exchange centers are at every corner. Cash or cards – You will see Visa/Mastercard signs everywhere, but that does not mean they honor it. While most restaurants, hotels and businesses accept credit cards as payments, not everyone does. Paying by cash will be more acceptable, especially in hostels. Unlike U.S., rather similar to European and other nations, you will need your PIN to use credit card (the restaurant waiters will bring their machines to you to swipe your card, as opposed to taking your cards inside as done in U.S.). Transportation – Public buses and mini-buses are everywhere. While big cities have public buses and/or metro trains, mini-buses or marshruty’s, inter-city transportation is done by shared-vans or marshruty. They are cheap and cover all of Georgia. Timings can be very strict and frequencies can be less between some cities, so make sure to check WikiTravel or your hotels for most updated information. For example, a metro/bus in Tbilisi costs GEL 0.50 each way in terms of costs. And there is only one mini-bus that leaves Kutaisi in the morning for Gori, in terms of availability. All the hotels accept credit cards as payments, but most hostels accept cash only. For really late arrivals, make sure to call the hotel during the day informing them about your arrival time. Breakfast is never offered as a part of the hotel costs and can be charged extra. Linens/towels/soap are always included in the price. Tap water is safe to drink in some towns only. One liter bottle of water from a local market will cost GEL 2. Wi-fi – This is available in all hotels and restaurants, although may not work all the time. Mobile services – For GEL 7 (approx $3), you can purchase a SIM card from any GeoCell store (at the airport right next to the exit) and use it for data-only of 2GB. The validity is 30 days and you can recharge at most groceries stores around the country. If you are using a smartphone, then you know how expensive international data plans can be. And if you find yourself lost in a place, then using the device for maps and directions can sometimes be a life-saver. But with no data to find directions in an unknown city can be frustrating. So while you are at your hotel where you have wifi access, open the maps app and point it to the address or area in the destination town or city. Then zoom-in and zoom-out around the area, or around the entire town if it’s a small one. This time the app will load all the maps and places in cache (memory). That’s it. When you arrive at the destination, just open the maps app and you will still be able to browse around without any data. Just make sure not to remove the app from the memory (kill it entirely). I booked hotels before traveling to Georgia. These were booked after reviewing them on Google, TripAdvisor, booking.com and WikiTravel. Tbilisi Namaste Hostel $110.68 Four nights. Double bed with balcony/terrace. Shared bathroom. Kutaisi Edemi Hotel $23.07 One night. Double bed. Ensuite bathroom. Mestia Guest House Edelweiss $29.90 One night. Triple bed. Ensuite bathroom. Ushguli Guest House Shoanelni $53.84 One night. Double bed. Shared bathroom. Dinner & breakfast included. Tbilisi Pomegranate Hostel $34.18 One night. Double bed. Ensuite bathroom. I booked flights to Georgia with the help of Turkish Airlines and Skyscanner. All prices are per person. Mestia – Natakhatari (Tbilisi) Vanilla Sky $28.63 One-way flight. Economy. Includes transportation from Natakhtari to Tbilisi. Note:All values in USD, unless otherwise mentioned, are approximate and based on the exchange rate of USD 1 = GEL 2.34 at the time of publishing. Each cost is for one adult. Turkish Airlines $749.20 Flight from Los Angeles, USA (LAX) to Tbilisi, Georgia (TBS) via Istanbul, Turkey (IST). Return. Vanilla Sky $28.63 One way from Mestia to Tbilisi. GEL 67. Accommodation for all days $125.83 Per person. See the list and costs above. Tips & info you need to know. Arriving in Tbilisi & traveling to Kutaisi, via Mtskheta, Gori, & Uplistsikhe. Visa, tips, details of planning. Sights of Kutaisi, and traveling to Mestia. Sights of Mestia & Ushguli. Traveling from Ushguli to Mestia to Tbilisi. Day trip to the wine country. Day trip to Mt. Kazbegi.